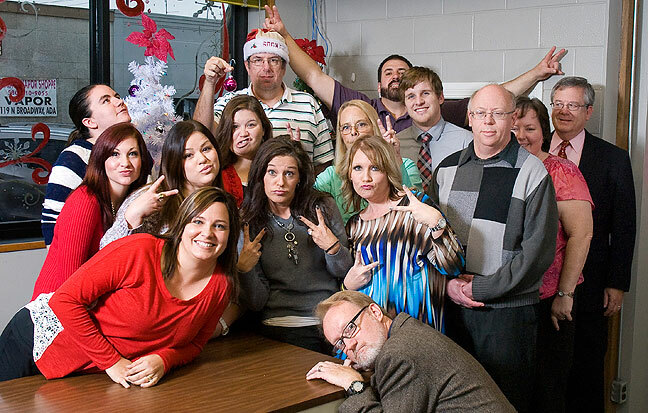 This is your humble host’s idea of a test frame prior to our annual office Christmas photo. 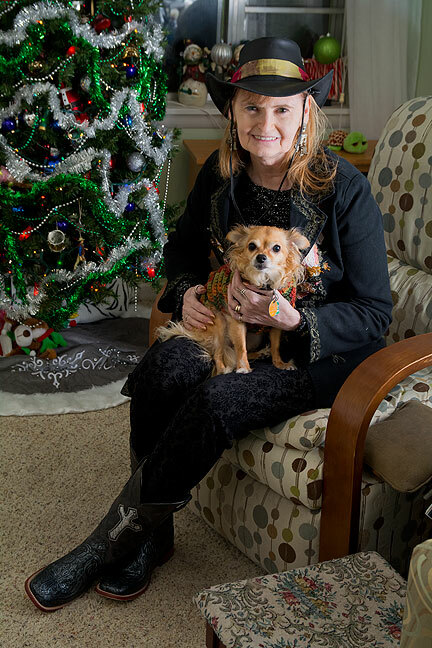 Abby has been cultivating a new look this fall, and felt it all came together just right Tuesday night, so she asked me to make this image of her with Sierra the Chihuahua in front of our Christmas tree. “They’re just working you to death.” ~Abby, as I left for work this morning. I explained to her that having lots of work to do is good for both my creative balance and my job security. All week long I’ve been creating content for The Ada News and Ada Magazine, and this evening I am slated for more. Yesterday I shot the annual Christmas ad group photo for my newspaper. In the past, I shot it by hand so I wasn’t in it, but this year I used a self timer so I could be in it. Two people were out for the day, so I shot mugs of them and we ‘Shopped them in later. I don’t know exactly why it’s a tradition to pose for a “goofy” shot at the end of a group session, but we wanted to do it, so here it is. Aren’t you going to reveal who’s photoshopped and who’s not? No one is ‘Shopped into the goofy image, and I can’t/won’t post the “real” group photo until it appears in the paper. When will the official photo be posted?